Philip Kutty Homestay, Backwaters, Kumarakom, Kerala, one of the scenes on a Kerala and Andaman Islands south India itinerary (photo by Geringer Global Travel, India tour operator). So many parts of India are thrumming with action, so travelers are often surprised at the unhurried pace of a South India tour. Things slow down here—whether you’re floating through the lush lagoons of Kerala or exploring the technicolor beauty Andaman Islands’ underwater reefs, it’s easy to understand why this region is popular with those interested in an easy-going getaway. With Geringer Global Travel , your custom itinerary of South India will offer that and so much more. Experience tribal life in farmlands and island villages, getting an idea of what life is like for the locals here. Trek through the diverse habitats of a wildlife sanctuary—maybe even spotting the rare and regal tiger—and learn to cook alongside a family in Kerala. Of course, you’ll also enjoy the distinctive experience of roaming the Kerala backwaters in a houseboat, as well as days spent on the picturesque beaches of the Bay of Bengal. Embark on a tour of South India with Geringer Global Travel, and get to know this tranquil region. Set in a stunning location between the Arabian Sea and the backwaters, Cochin is considered the gateway to Kerala. The city was founded in 1341 when a flood created a natural safe port and is known for having a diverse religious make-up, including Christian communities and a once robust Jewish community. Visit the Dutch Palace (also known as Mattancherry Palace), which was built by the Portuguese and presented to the Raja of Cochin in 1555 AD. Explore the 16th century Jewish Paradesi Synagogue, the oldest synagogue in India, and see the famed Chinese Fishing Nets and St. Francis Church. Later, enjoy a cooking demonstration followed by lunch with a local family. In the evening, witness the most elaborate dance form in southern India: Kathakali. As your tour in South India continues, visit Thekkady, home to the Periyar Tiger Sanctuary. In the afternoon, take a bullock cart ride in the nearby farmlands, exploring the tribal and local life of the area. Your guide will point out the plantations along the way, and you can stop to talk to villagers—a great opportunity to gain insight into the local culture. Set off for an invigorating nature trek in the Sanctuary, traversing diverse habitats with the guidance of your naturalist. This is a chance to spot some truly unique birds, butterflies and other wildlife. In the afternoon, explore thespice plantation in Thekkady, where you’ll learn about the cultivation of different spices and how they are used in specific types of cuisines. 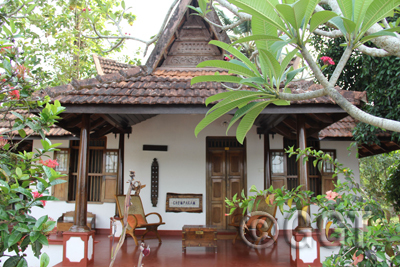 Transfer to Kumarakom, where you’ll stay at Philipkutty’s Farm. Here, you’ll be welcomed and looked after by your host family while also enjoying the privacy of your waterfront villa. In the evening, enjoy a cooking lesson, where you’ll learn the secrets of Kerala cuisine from the family matriarch. There are a variety of dishes prepared, each with special touches that have been handed down over generations. On your own today, take the opportunity to explore Kumarakom, known as the “Venice of the East.” Set in the lush backwaters of Kerala, Kumarakom is a serene lattice of lagoons, palm-fringed lakes and winding canals. Float through this paradise and watch as rustic boats carry everything from fish, rice and coconuts to the milkman and local politicians. Drive to Alleppey, where you’ll cruise the famed Kerala backwaters on an overnight houseboat. Along the way you will pass rice fields, tiny villages and women completing household tasks such as laundry and washing utensils. You will disembark to wander in the villages and talk to the people, getting a sense of what life is like here. This is a quintessential Kerala experience. After breakfast, you’ll drive back to Cochin, where you’ll have a day to simply relax or enjoy more of what this fascinating city has to offer. Fly to Port Blair and onward by boat to Havelock, one of the most captivating of the Andaman Islands. These isles offer plenty of interesting activities, including rainforest discovery tours, swimming, water sports and more. Whether you’re out on the white-sand beaches or out on the unspoiled reef, the Andaman Islands will amaze you. The pristine waters surrounding Havelock Island are a paradise for snorkelers and scuba divers, and you’ll have ample opportunity to explore its underwater wonders. Or simply unwind at your hotel, and revel in the paradisiacal pleasures of this part of the world. You’ll have another full day to immerse yourself in the serene island life. The Andaman Islands are inhabited by tribes that still maintain many ancient traditions, and you can get a glimpse of some of them while you’re here. Board the ferry back to Port Blair, and relax for the evening. This morning, fly to Cochin, where you’ll be met and transferred to your hotel. Your tour of South India comes to a close, as you make your way to the airport to board your flight home. This is a suggested South India and India Island itinerary—we’d be happy to customize an itinerary to fit your needs. Whether you prefer a shorter or longer journey, would like to include other parts of India or simply need something to fit your budget, please contact us at 877-255-7438 or email us at info@geringerglobaltravel.com to discuss how we can create a personalized India tour for you.